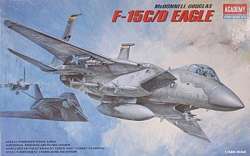 Detailed kit from Academy of the F-15 Eagle which can be built as either an F-15C or an F-15D. The McDonnell Douglas (now Boeing) F-15 Eagle is an all-weather tactical fighter designed to gain and maintain air superiority in aerial combat. It was developed for the U.S. Air Force, and first flew in July 1972. The F-15E Strike Eagle derivative is an all-weather strike fighter that entered service in 1989.